A traditional Filipino celebration marking the coming of spring, the Festival of Flowers at Hawaii's Plantation Village will also pay tribute to our islands' multicultural society. The Flores de Mayo -- Parade of Flowers -- will feature girls wearing white, carrying flowers, and leading a procession of people dressed in ethnic clothing. There will also be a special ikebana exhibit of 12 traditional Japanese flower arrangements, along with performances of the Korean Farmer's Dance Group, the Paranku Clubs of Hawaii, and the Honbushin and Yamada Dance Groups. And back by popular demand, a genealogy workshop will be presented in the village's social hall, where people can trace their roots with the help of Hawaiian, Chinese, Portuguese, Puerto Rican, Japanese, Okinawan, Korean and Filipino lineage experts on hand. Food booths and keiki activities round out this event, taking place 10 a.m. to 2 p.m. Saturday at the village at 94-695 Waipahu St. Admission is free. Call 677-0110 or visit hawaiiplantationvillage.com. It's the beginning of the summer movie season, with the hotly anticipated "Iron Man" movie opening this weekend. So it must be time for Free Comic Book Day. Participating shops and libraries across the country will be handing out on Saturday more than 2 million comics of all kinds, including reprints and samplers. But don't get all crazy loading up on titles willy-nilly. Public libraries in Aiea, Hawaii Kai, Kailua, Kalihi-Palama, Kapolei, Liliha and McCully-Moiliili, and Hilo on the Big Island and Lahaina on Maui, will give you one free comic book just by showing your Hawaii State Public Library System card. Anticipated titles include a Hellboy/B.P.R.D. edition (the Hellboy movie sequel "The Golden Army" opens July 11), a reprint of the Eisner Award-winning first issue of "All Star Superman," "Project Superpowers" from Alex Ross and Jim Krueger, a special "Transformers Animated" edition, an "X-Men" issue by Mike Carey and Greg Land, and "Shonen Jump" and "Gegika" manga samplers. After all that Spam you've consumed the previous day at the Waikiki Spam Jam (see our Do It calendar on Pages 8 and 9), help settle down your opu with some Hawaiian entertainment at the Sunday Showcase at the Plaza Stage of the Waikiki Beach Walk. Every Sunday from 5 to 6 p.m., expect to see a diverse lineup featuring hula, and old favorites and contemporary island sounds. This weekend, it's Ekolu Mele, featuring the music of Duanne Laanui, Teve Tolentino and Derrick Mau, and featured dancers Mona Yamada and Malama Iwaliko. On successive Sundays, performances by MighTy J, singer Paul Shimomoto, and Traci Toguchi, respectively, will fill out the remainder of May. The showcase is a collaborative effort between Outrigger Enterprises Group, the Hawaiian Music Hall of Fame and the Hawaii Academy of Recording Arts. Admission is free. Once a year, the heavenly elements align just so, and the sun sets into the crown of Pu'u o Kapolei. The occurrence is clearly viewed from a site just west of the Waikiki Aquarium, which celebrates the event as the official changing of the seasons from Ho'olilo (wet) to Kauwela (hot or warm-dry). The sunset observance "Seasons and the Sea" takes place from 6 to 7:30 p.m. Friday and will be marked with a free celebration of chant, hula and mo'olelo (storytelling). Sam 'Ohu Gon and Hula Halau Mele will perform, explaining the seasonal changes and the link between human behavior and ocean life. Fishing artifacts will be on display and Malama Hawaii will host a booth about the International Year of the Reef. Bring mats or low chairs and sunglasses to the fenceline on the beach just outside the aquarium. Call 440-9006. Gordon Biersch is celebrating the merry month of May with a seasonal Maibock menu highlighted by the medium-bodied seasonal brew. Nine new items have been added to the menu for the occasion. Selections include a trio of Kobe beef sliders ($11.95); dijon-crusted salmon ($19.50) with a spiced mustard crust and dill cream served with ginger rice and seasonal vegetables; lobster mac and cheese ($22.95); and top sirloin ($23.50) layered with shrimp. What these all-American creations have to do with May or Bavaria, I don't know, but the harbor setting is relaxing, and I don't think people ever need much of an excuse to head out for a pau hana beer. Let's not forget Cinco de Mayo is also coming up, and there's no reason you have to stick to a Mexican menu that day either. A liquid diet usually prevails. The Maibock and menu will be offered through May 18. While there, enter to win GB's "20 Years, 20 Ways to Celebrate, 20 Ways to Win" sweepstakes with a grand-prize trip for two to San Francisco and more than a week of Gordon Biersch 20th anniversary celebration festivities. Entries must be received by May 18. GB is open 10 a.m. to midnight Sundays to Thursdays, and 10 a.m. to 1 a.m. Fridays and Saturdays. Dinner for two costs about $50 without drinks. 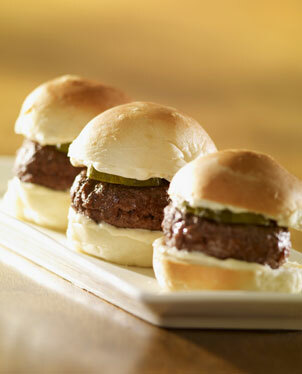 Sliders of Kobe beef are among the new menu selections at Gordon Biersch.